I am usually optimistic, as evidenced by being a lifetime Cleveland sports fan. To be fair the Cavs have done very well of late, but the Browns and the Indians are a life lesson in high hopes and heartbreak. This story is not about Cleveland teams and life’s disappointments, it’s about two nights broken down in Beckley West Virginia that went from disappointing to serendipitous. Day two didn’t seem much better. We spent most of the day cooped up in the motor home while it was worked on in a dark windowless shop. The repair shop had a “trucker’s lounge” which was about as comfortable as it sounds, so we stayed put. By early evening, we were back at “our” rest stop, ready for something, anything else. That something else turned into a tour of Beckley. Many of the old buildings downtown had been renovated, but there were no shops or restaurants to be found. The county courthouse occupies the center of town, and most of the renovated buildings housed law offices or bail bond places. There were pretty old homes scattered here and there, relics of past glory when coal made the community rich. The best thing Beckley has going for it is the nearby New River Gorge, and is trying to reshape itself into something more viable. Beckley is not a large city, still it has a suburban shopping district large enough to have most of the usual chain eateries–Applebee’s, Ruby Tuesday and the like. We were on the hunt for someplace local to eat. A traveler’s rule of thumb is to look for a place with lots of cars, which usually signals a likely spot. So it was we happened upon Calacino’s Pizzeria. The parking lot was jammed. We entered to find the the front room was nearly empty. The crowd was all in back for either sports TV or karaoke (we think it was karaoke night). That being said, the wood-fired pizza was excellent. 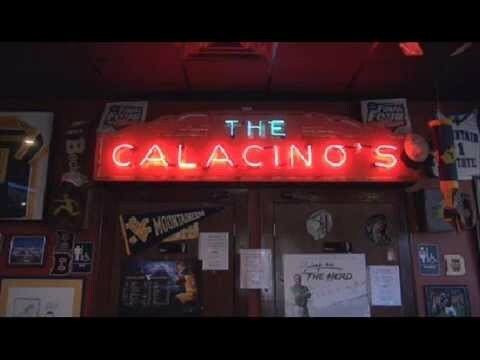 Calacino’s is a long-time Beckley establishment. If you’re ever in the area, check it out. It’s worth a side trip. The food was great, but that was just the start of the evening. Calacino’s bar, where the action is! We chose to eat at the bar. The waitress was pleasant and solicitous. I couldn’t help but notice the guy sitting next to me. He was a bit rumpled in a professorly way, munching on spaghetti and meatballs. What got me interested was the Suface pro tablet and smartphone on the bar next to him. We were chatting with the waitress, asking about the restaurant when he spoke up. “They have quality people here too, like Marcy (not her real name, which I have forgotten) here,” he said. Ben is usually the one who talks to strangers, but my curiousity overcame me and I spoke first. “Are you a regular?” And the aforementioned Marcy answered my question with a knowing laugh. The next hour or two turned out to be very interesting and surprising. I introduced myself and asked what he did. Mike G. Introduced himself as a retired clarinetist. We had a lively conversation that covered topics ranging from conspiracy theories (Kennedy) to favorite clarinet solos. Mike is the founder of the World Clarinet Alliance (www.worldclarinetalliance.org), a group with a mission “to support music, the klarinette [sic] and each other.” He is also their webmaster. I wouldn’t say that he was in love with Beckley, but as he said, “you can’t beat the cost of living here, and I don’t have the retirement package to live where I want to.” His tablet was packed with video clips of clarinet players performing all manner of solos, pictures with other musicians, and so on. When he pressed me, I admitted that I played the clarinet in high school. He was nice enough to treat that bit of information respectfully. When I asked him if he played out locally, he said “there’s not too much call for chamber music in Beckley.” We had a great time chatting with Mike as he played videos featuring amazing musicians that most of us folk wouldn’t recognize. You don’t usually bump into a retired concert musician (or a working one for that matter) on any given day no matter where you are. We get so used to seeing the handful of performers who achieve stardom in a big way that it’s easy to forget there are thousands upon thousands of very talented musicians who toil away in relative anonymity, playing for the love of the instrument and the music. There isn’t much support for the arts beyond what is considered “popular,” and that is a very narrow band indeed. We finished our meal and left him as we’d found him, at the bar sipping Diet Coke. As soon as I got somewhere with good internet service, I googled him of course. His name pops up here and there with recognition in the music world for his playing and support for the clarinet. That’s what I love most about travel. You never know what or who will be around the bend, or for that matter, sitting next to you waiting to be discovered. Red Dog is quite an entertaining writer. Looking forward to his next tail. Whoops. I meant tale.